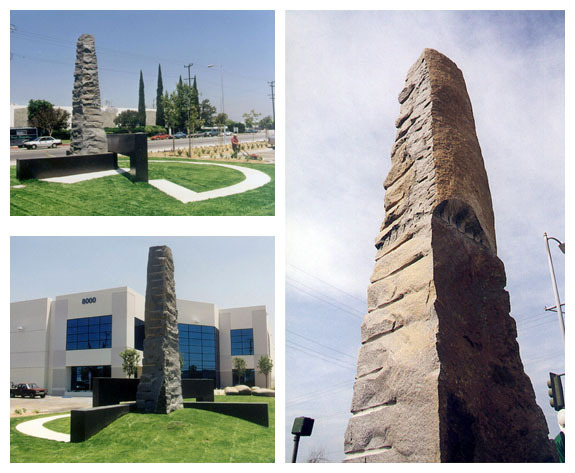 Four public art works titled JUNIPERO SERRO, EL SEGUNDO, LA MIRADA, and NOVO REDONDO, were commissioned by The Lewis Company for Prudential Real Estate’s new business park in Van Nuys, CA. They are located directly in front of the main entrances to the four buildings that presently make up this complex. 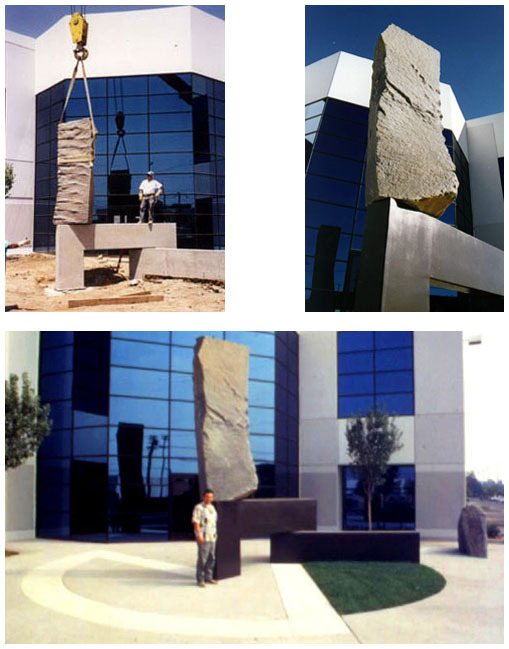 These large-scale works (15”H x 50’ x 35’ aprx.) 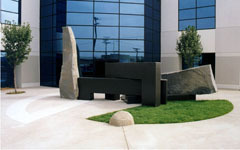 are composed of intersecting man-made and natural elements: granite, concrete, and grass. 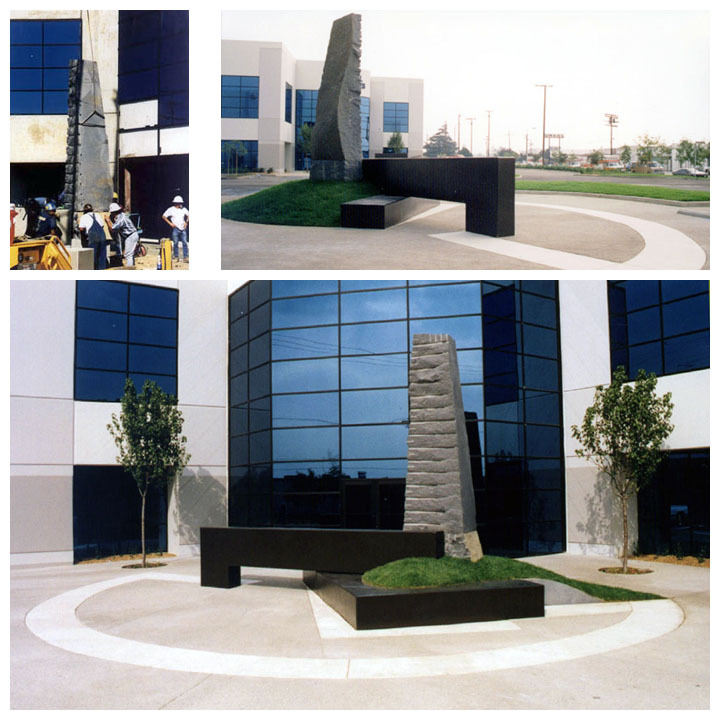 All hardscape components of this work are durable and able to withstand the interaction of an unsupervised public. Furthermore, they are seismically engineered and virtually maintenance free. 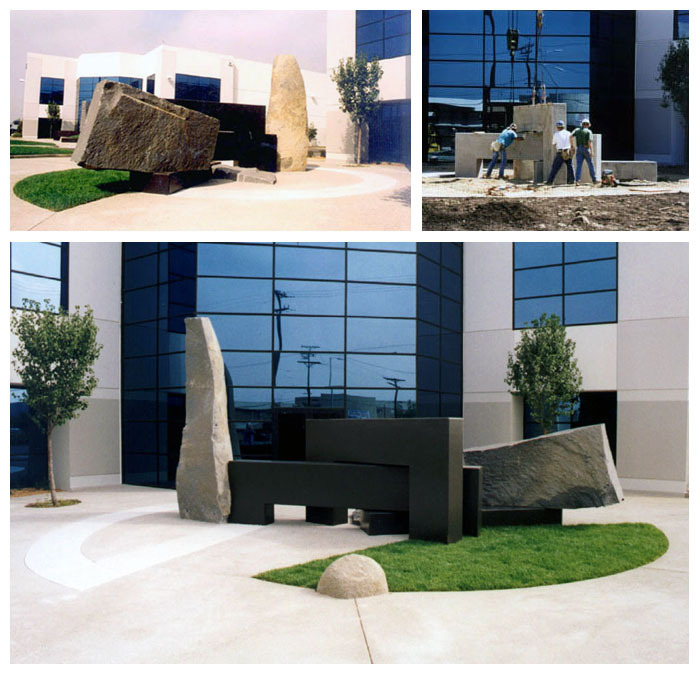 These sculpture/plazas are not objects, but places that function as points of transition and gathering sites. 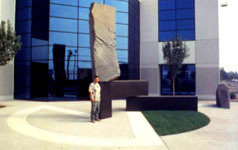 They invite viewer participation, where the sculpture is not only seen, but experienced as well. 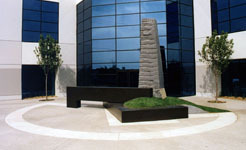 All four works consist of three-dimensional cast concrete forms reflected and extended on grade level with two-dimensional white concrete paver lines, and a section of tightly manicured landscape sliced to reinforce this logical flow. This hard-edge geometry is challenged by the inclusion of large, natural, granite elements that create surprising relationships, that jostle one’s expectations. From various viewpoints the plaza “palette” appears in different combinations of textures, color, and forms, rendering these unlikely materials into compositions easily readable from afar. This shifting of viewpoint, guided by the two-dimensional paver lines, causes the structure to appear in flux, capable of movement and change. This work is a reflection of the environment, an attempt to distill the urban landscape through an unexpected union of technological and natural form. These large works provide a haven for contemplating the notion that opposing forces may be forged together to produce an unexpected harmony.